Chris was spending time between Cornwall and London, having experienced the punk explosion at its source he wanted to bring some of that excitement to Cornwall. He had played as a duo in London with Paul Cousins, although the duo spent a lot of time rehearsing they never played live. Purple Slugs were formed in Truro. The band originally started life as a trio, with no drums. They spent a lot of time rehearsing, making use of the Crypt at St Paul's Church on Tregolls Rd. 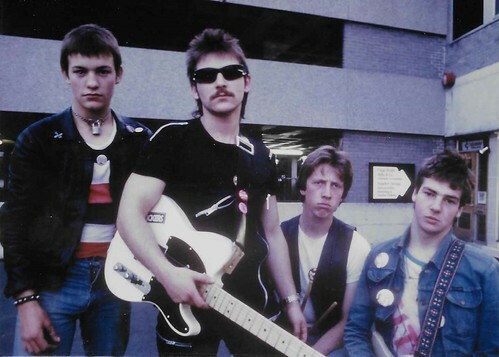 They looked the part of pure punks, and were one of the few proper punk bands around the Truro area. Despite relatively thriving scenes in St Austell and Penzance, punk never quite got a foothold in Truro which was dominated by rock bands, and discos. The Purple Slugs played live around the venues of Truro, including the William IV. They were also scheduled to headline a punk festival at the Truro City Hall Annex. Unfortunately while they were off wandering around town waiting for their slot the festival was shut down and they didn't get chance to play! They built up a small following around town, being the only 'real' punks in the area. The only other punk bands locally that the Purple Slugs were really aware of was The System from St.Austell and LD50 from Camborne, who would later become Zeitgeist. Chris was a big music fan and often visited Gerry Gill who was at the time selling records out of the market in Truro, the pair would often trade records. Gerry became aware that Chris had a decent pair of Koss HV1 headphones and persuaded Chris to swap them for a stack of LPs. He would then proclaim that these headphones were the first piece of gear for his new recording studio, which would later take shape as Roche Recording Studio. After a couple of changes on bass Kevin Evans would settle in the band. Kevin had previously played with the popular Welsh punk band the Tax Exiles. The band were still known as the Purple Slugs at the time, but Kevin would bring a slightly different sound to the band with his Wasp Synthesizer. As they moved into late 1979 and a more post-punk sound, they would change their name to Modern Missiles. Chris was keen to capture the sound of the band and make a demo recording. Remembering his friend Gerry Gill's studio he booked the band in to Roche Recording Studios to lay down some self-penned tracks on a November 1979 session. By this point Gerry had moved on to other ventures and Hawklords drummer Martin Griffin was running the studio, which caused great excitement for fellow drummer Tom Stone! Over the course of the weekend they band laid down six tracks, interrupted by a minor detour in to St Austell to purchase some guitar strings. Having never broken a guitar string, and in true punk style, it didn't occur to Chris to bring any spares, much to the bemusement of Martin. The new synth focussed sound of the band didn't quite gel, and the band split not long after, the Roche Studios tape remaining in its box for a further 40 years before getting another airing. Kevin would go on to join the White Brothers in London, a popular early electronic rap band in the early 1980s. He's now based in Zimbabwe. Chris would join Andrew Cox in the early 80s playing electronic music as Exposure. At the same time he set up his own label Shock Treatment, then Cloud Nine Records. There was some interest and he signed a few bands, including Ed Banger (post-Nosebleeds) and the Stupid Humans (Pre-Subhumans). In 1982 Ed Banger recorded some tracks in a studio in Manchester, of which Poor People b/w Vicars In the Dark Chris would release on Cloud Nine Records (CNR01). Sadly it would be the only release on the label, thanks to a distribution deal with Pinnacle that didn't work out the label folded before it had the chance to get any of the other bands in the studio. While still passionate about music Chris would remain out of the music business for quite some years. Always having a creative flair he would take up painting around 2000 and has since become a modern artist of great renown. His work, including an exhibition of punk paintings, have been exhibited all over the world. In September 2018 he returned to music and set up a record label, Jynnji Records, with the driving force being about giving artists the exposure and an outlet for their talents.